David Hollen is a mid-western man with a very urban sensibility. Originally from northeastern Wisconsin, this current Arts District resident creates abstract contemporary sculptures that are both whimsical in feeling and industrial in nature. His high-tech work involves fabrication of various materials including, but not limited to, wood, steel, porcelain, rope, stainless steel cable, rubber, and acrylic. Creating work in three sizes, Hollen addresses collectors and clients on multiple levels. Need something bold for your desk or tabletop? There are pieces 12”-16” high that are perfectly suited. Have a large entryway or foyer that requires an impressive sculpture of 8’ -12 ‘ tall? That is the bulk of Hollen’s work, building architectural pieces for collectors who want that dynamic ultra-modern sculpture in their home or office. There are wall-mounted sculptures as well, highly decorative pieces with ceramic thorns, brightly colored jeweled accents, or rubber flowers. But his commissioned public art that is meant for commercial spaces, large lobbies, and museums is where he really shines! Monumental sculptures that dominate public courtyards are the future for this creative genius, as in the work already installed at the soon-to-be-opened Ridgecrest Sculpture Park. Taking the most common of materials and transforming them into very unusual contemporary sculpture is the hallmark of Hollen’s work. Using simple stainless steel cable, he is able to create waterfalls, wreaths, and other curvilinear and decorative designs. 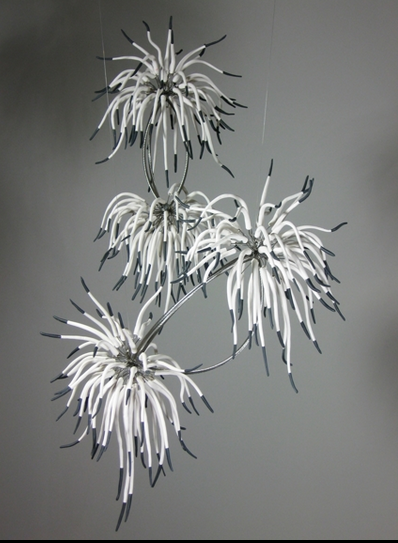 Take that same cable and add some rubber bits, and you have puffy “flowers” on bendable stems, creating unique and innovative wall sculpture. Delicate cast porcelain strips become thorns, and when juxtaposed with steel rods, render a piece that is both fragile-looking, yet robust in its’ manufacture. Often anthropomorphic or organic in concept, the combination of the hearty industrial materials and complex engineering lends each one-of-a-kind abstract sculpture a definite personality. Another aspect of Hollen’s business is his commissioned work developing decorative metal doors, screens, and gates. 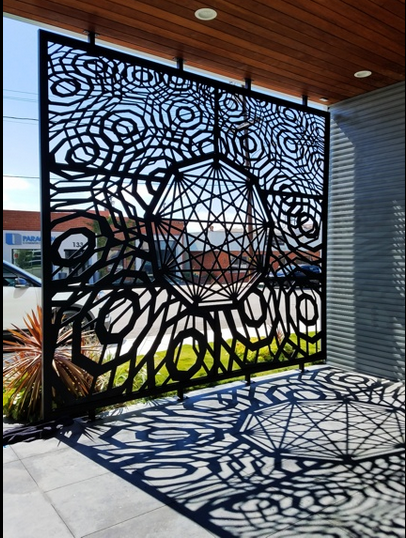 Functional while being incredibly beautiful, these custom works can be created in polished stainless steel, powder coated in any color, or faux-finished to achieve any desired effect. They are truly the epitome of functional art! Hollen’s distinctive work makes it highly sought after for film and TV sets, and a natural for high-profile locations. He has designed and built commissioned art for theater groups, commercial properties, and multiple public spaces and parks, including Pershing Square in downtown Los Angeles and Stoneview Nature Center in the Baldwin Hills Parklands. His work as also been shown in galleries across Southern California and in several museums, including the Torrance Art Museum and the Orange County Center for Contemporary Art. Please contact me for more information or to arrange a tour of the artist studio. See examples of his work under the ART section of this website.